You can change the default colours of the deformation controls in the Preferences panel. 1. In the Preferences Panel, under the General tab, click on the Edit Colours button. The Colours dialog box opens. 2. In the Colours dialog box, select the Deformation tab. 3. To open the Select Colour dialog box, click on the square colour sample corresponding to the specific control you want to change the colour of. 4. 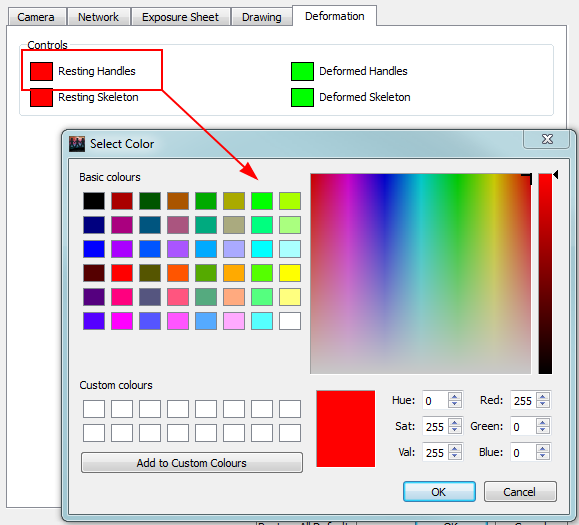 Select a new colour and click OK to close the Select Colour dialog box. 5. Click OK once again to exit the Colour dialog box. You can click Restore All Defaults to go back to the default colours.